24″ wide by 36″ tall. 20 gauge steel. Boxfold frame. This is made from a Hallowell Heavy Duty steel shelf. The die image was etched by placing the steel shelf in a plastic kiddie pool filled with salt water and then using a car-battery charger with the shelf serving as the anode and another piece of steel serving as the cathode. 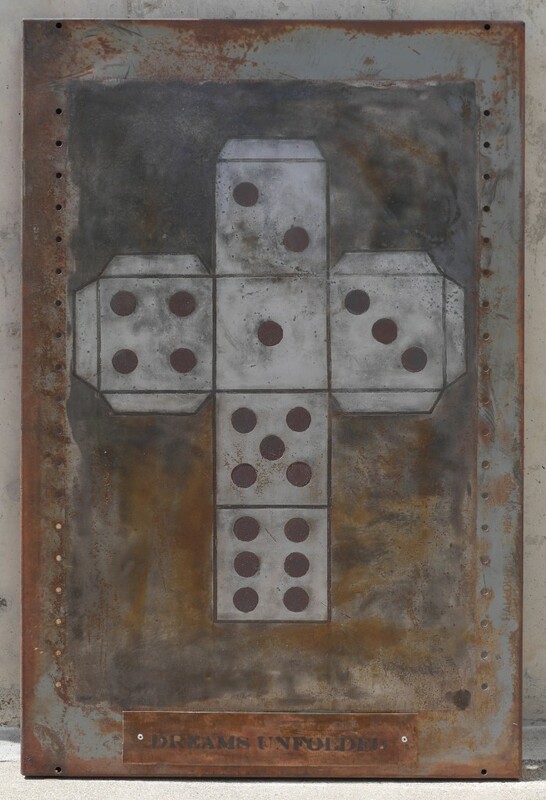 Once etched, the lines and circles were selectively rusted, and then the faces and folds of the die were hand sanded. A steel name plate was fabricated and attached to the bottom-front of the piece with two steel rivets.